With technology the way it is these days, you can connect to anyone, just about anywhere. And for just about anything. Sometimes this is good. Sometimes this is bad. I suppose one of the “good” things about this is finding support in others who have experienced the same thing you have. I became devoted to reading a handful of blogs about these women. I even continued to read their stories after I became pregnant with baby #2. Reading their stories while pregnant should have set off a fear in me for my own pregnancy, but it didn’t. Once Oliver was born, my time quickly diminished and reading blogs was no longer on my to-do list. I always wondered why I continued to read about the tragic stories of people I did not know for so long. Now I know. It was preparing me for what was to come, even though I didn’t know it at the time. Those stories have always been in the back of my mind. I just never imagined that I would walk in their shoes someday. Over time, I would check in to see where the lives of these families had taken them. Most of the blogs had turned from sorrow to joy. They were documenting more of everyday life, the good times. Some were still documenting the pain, sorrow and tears. In the past week, I have started researching again, looking up websites that deal with grief, loss of children and loss of newborns. I have signed up for newsletters, liked them on Facebook and bookmarked them for later use. As I have been researching, I have once again stumbled upon the stories of others. One website, in particular, is nothing but stories. It is specific to miscarriage, stillbirth and infant loss. You can submit your story, as well as your blog, for those that have one. I have read a handful of the stories and clicked on a few of the blogs. These women are bearing their souls for all to read. In my opinion, some of the information is too personal to share with the entire world. The idea is that women who have had a miscarriage, stillbirth or infant loss can find comfort and support through the stories of others. While I can see some of the content as beneficial, some of it is not so much, at least not yet. One of the benefits to many of these baby loss communities, as they are called, is that you can find others who have been through what you are going through. While certainly nobody’s story is the same, there is a sense of comfort in knowing there are many, many other people out there that have gone through what we are going through. We have a wonderful network of family and friends that have supported us beyond our expectations. Having connections outside of this network, even with people we don’t know personally, is a positive thing as well. We have been blessed to be connected with two families outside of these baby loss communities who have also lost baby girls to stillbirth. They have been a great support and sense of strength during these early weeks of losing Kyleigh. Sometimes it is beneficial to have someone to talk to who has been in the same valley as you, whether it is face-to-face, through email or a blog. The jury is still out as to whether I will find any of these baby loss communities helpful. I’m sure over time they will be. I have to be careful not to get sucked in though. Quite honestly, a lot of the content is depressing to read. I don’t need to read other people’s depressing stories. My goal is to find two or three blogs that are not only helpful, but inspiring. I don’t need to read about someone who lost their baby a month before or after me. I need to read about someone who lost their baby two years ago or ten years ago. I need to see that it does get better. Life does move from sorrow and tears to joy and smiles. I have not decided yet whether or not to add this blog to the list of others within these baby loss communities. I’m not sure that now is the time. If I decide to in the future, my hope is that Kyleigh will be honored through posts of happiness, not sadness. That others will see the progression from pain to healing and that they will see a love for a baby girl like no other. My uncle and I share a love of peanut butter frozen yogurt. Rodger has a newfound interest in the NBA. Sometimes the saddest of times are also the happiest of times. Rodger is the best Dad in the world to our children. My Dad is the best Dad in the world to me. I already knew the last two, but since it is Father’s Day, I thought I’d include them. Happy Father’s Day, Rodger and Dad! Love you both!! A wonderful woman joined you in heaven on June 9th, your Great-Grandma. I know that your days have been even more glorious since then. She promised me that she would take care of you and I know that is exactly what she has been doing since she got to heaven. I imagine her rocking you in a rocking chair, just as she did with Oliver and Garrison. Great-Grandma was too sick to come to your Celebration of Life and I know that was very upsetting for her. While none of us here on Earth wanted her to join you so soon, it brings me comfort and peace to know she is now with you forever. I am blessed to have been with her in her final days and at the moment that she went to be with you and Jesus. I will tell you more about her another time, but for now, snuggle down in her arms and tell her I love her. Rodger and I meet with a small group every Friday night for dinner and conversation. This small group is a product of The Walk to Emmaus and is often referred to as a Reunion Group. It is a time to meet with others and share our experiences of our walk with Christ during the past week. One of the things often discussed is a Closest to Christ, the moment during the past week when you felt closest to Christ. My aunt passed away early this morning. We got word yesterday that she was not doing well so my parents left town to be with the family. When they arrived at the hospital, the first thing my aunt said to my dad was that she didn’t have much time left. Two of my four cousins were at the hospital and my aunt kept asking where the others were. Once they were all there, they said their good-byes and a short time later, my aunt passed away. She was surrounded by her family: her four daughters, her little brother (my dad), her big sister, and her mother (my 90 year old grandma); all the people that love her the most. It amazes me that people have a sense that their time is running out and that they hold on until the ones they need are there. Once I pulled myself out of bed this morning, I went downstairs to let the dogs outside. On our deck we have two hibiscus plants, a pink one and a red one. They produce beautiful blooms, but hardly ever at the same time, or with even more than one bloom at a time. This morning, there were four blooms; one pink and three red. The pink bloom was fully open and pointed towards the sky. The red blooms were still working on opening all the way and were facing the ground. One red bloom was resting on the rail of the deck. I immediately thought of my family. The pink one, which stood higher than the rest, represents my grandma. The three red blooms represent her children; my dad, and two aunts. The red bloom that is resting on the rail represents my aunt who passed away. Then, as I sat here typing this and looking at the blooms again, another thought came to mind. What if the pink bloom that is fully open and facing the sky is my aunt? She is finally free of all the pain and sickness and is in heaven where she can bloom to her fullest. The three red blooms that are facing the ground are my dad, aunt and grandma, mourning the loss of their loved one. The red bloom that is resting on the rail is my grandma who needs the extra support, for no one should have to endure the loss of a child. God works in wonderful ways and I believe He opened those blooms this morning in memory of my aunt. On Mother’s Day of this year, I received a beautiful bouquet of spring flowers from a friend. She told me that she was thinking of me and asked about how my emotions were that day, knowing that it would be a bittersweet day for me. The bouquet consisted of pale pink, yellow and white flowers, mostly daisies and mini carnations. There were multiples of all of the flowers, except for one, a beautiful Gerber Daisy. This particular daisy stood out to me not only because of it being the only one like it in the bunch, but also because of its color. It was a perfect blend of various shades of pink, with just a touch of yellow. Most Gerber Daisies are bright, vibrant colors, while this one was pale and subtle. It instantly made me think of Kyleigh. I took the flowers home and put them in a vase on the kitchen counter. The next morning, all of the flowers were standing tall, except for the Gerber Daisy. It had already drooped, falling over well beyond the top of the vase. Seeing its beautiful petals facing the ground made me think of the words from above that I wrote almost six years ago about my Aunt Alma’s death. I thought back to the pain that my aunt went through as she suffered from a cancer that eventually took her life. I thought about my grandmother who had to bury her daughter and how at that time, I could not imagine ever having to do that. Little did I know as I typed those words almost six years ago that I would experience that same pain of burying a daughter. 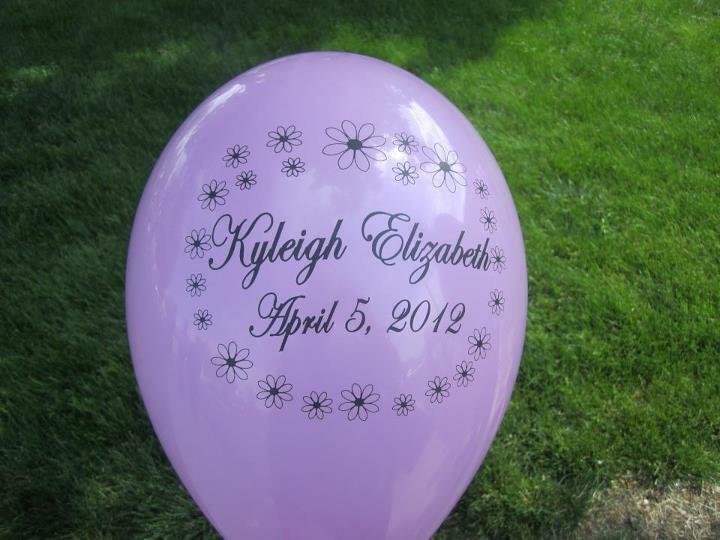 Kyleigh was welcomed into heaven by my aunt and grandma that I speak of here. While it still saddens me that they have left us, it brings me joy to know that they are taking care of Kyleigh now. All of the other flowers continued to thrive and stand tall for well over a week. I left the Gerber Daisy in the vase until the other flowers were ready to be disposed of. It was a reminder to me that no matter how beautiful and perfect something appears, whether it’s a flower or my daughter, some things are just not strong enough to sustain life. The pink and yellow Gerber Daisy was not strong enough to sustain life. Kyleigh was not strong enough to sustain life. Sometimes all that is needed is a little support to make it through. The red hibiscus was not strong enough to hold itself up. It needed support. Loved ones who are fighting cancer are not strong enough to hold themselves up. They need support. Mothers who have endured the death of a child are not strong enough to hold themselves up. They need support. 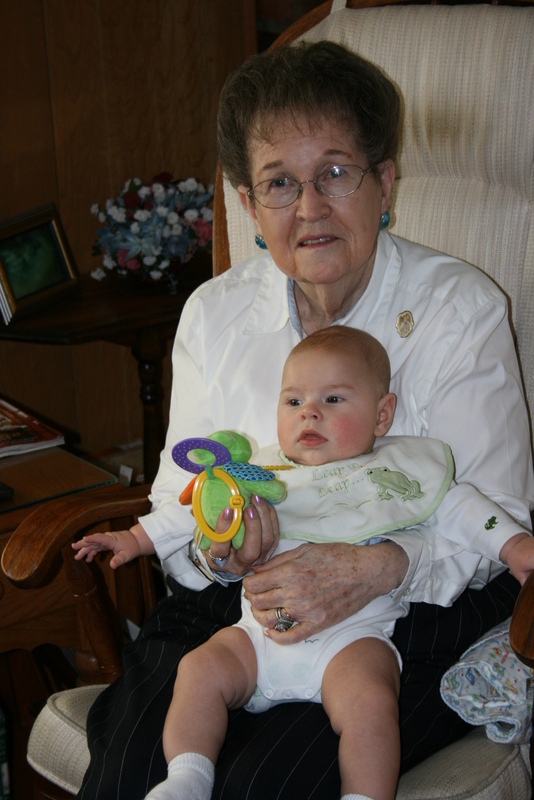 As I write this, my maternal grandmother is waiting for God to call her Home. It brings me peace to know that Kyleigh is waiting for her great-grandma to join her in heaven. Grandma has had the support of many during her fight with cancer, but now her body is not strong enough to sustain life. Please continue praying for my family. We need the support. I found myself at Kyleigh’s grave the other day and this time I was alone. I love going out there with the family. Taking the boys out there gives us a certain freedom to talk about her. I also enjoy talking about the other things that we see. Walking around we see tributes that other people have left to their loved ones and I think it helps the boys understand life. It certainly gives them a perspective most boys and girls their age don’t generally tend to have. My favorite thing is when we’ve been there for a few minutes, and Garrison asks, “Go see Jesus?” There’s a life-size Jesus, perhaps better said – there’s a person sized Jesus not far from Kyleigh’s grave and Garrison likes to walk over and see it. His statue is standing on an engraving of the 23rd Psalm, and there’s comfort in that. When all of the family is not there however; and it’s just Leann and I, or when I’m alone, my thoughts are focused differently. I mostly think of Kyleigh; but often times I find myself thinking of God as well. The things that I think about quite often surprise me. On Thursday when I was alone, it wasn’t all that different from other times. I was sad for sure, missing her and longing for the day in the distant future when I’ll have the privilege to hold her again. I found my mind swirling, my grief overwhelming, and I found my thoughts stuck on the fact that she simply did not deserve this. She didn’t deserve to live for 39 weeks, 4 days in the womb only to depart her body just moments before her birth. She should have taken that breath, lived a long life and enjoyed the celebrations and milestones that we expect of all our children. I kept coming back to that word – deserve. Most assuredly my sweet and precious daughter deserves all of these things! These are all things that I know she would want. They are all things that I want for her, yet these are precisely the things that I am incapable of giving to her. Only God, the source of every good and perfect gift (James 1:17) is capable of providing the pathway to these things. As difficult as it is for me to write, I’m in fact blessed that she has these things now and wasn’t required to suffer the trials and tribulations of life before they were given to her.